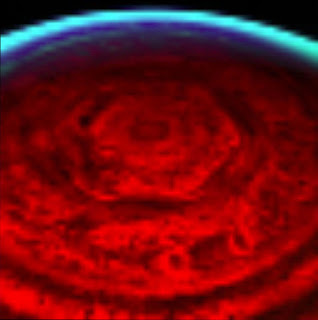 This nighttime view of Saturn's north pole by the visual and infrared mapping spectrometer on NASA's Cassini orbiter reveals a dynamic, active planet at least 75 kilometers (47 miles) below the normal cloud tops seen in visible light. Clearly revealed is the bizarre six-sided hexagon feature present at the north pole. The strong brightness of the hexagon feature indicates that it is primarily a clearing in the clouds, which extends deep into the atmosphere, at least down to the 3-bar (3-Earth atmospheres pressure) level, about 75 kilometers (47 miles) below the clouds and hazes seen in visible wavelengths. A more detailed image of the hexagonal feature. The shape seems to be stable over decades, since it was first noticed in pictures taken in 1980 by Voyager 1 and 2. The Holiday is a romantic fantasy, with a great cast, including Cameron Diaz, Kate Winslet, Jude Law in what may be his best romantic performance, Jack Black in his first romantic role, and Eli Wallach, still spry at 90. WARNING -- This post contains SPOILERS. OK... it's not like any great secrets are going to be revealed... but the film depends in part on little surprises, so any information about the film may be more than you want to know before you see this film. If you don't read on, then you should just know that in addition to being a romantic fantasy with an attractive cast and a first rate romantic-fantasy writer-director, the disk contains a first rate commentary by the writer-director, Nancy Meyers, on both the writing and directing. The Holiday is a romantic fantasy, where the great men are loving single dads... or sensitive composers who write a theme just for you... or cute old men as helpless and adoring as puppies; and the not-so-great men look terrific and talk seductively, but sleep with or even marry other (younger!) women. As for the women, they work hard, live in the most beautiful houses in LA or country England (all alone after they are betrayed by their men), and are miserable, trapped, insecure, and confused; yet potentially, happy, free, independent, confident, loving and lovable. The film contains laughs and chuckles. It has some little surprises. It is well acted, nicely directed and even believable (insofar as possible). And of course it ends well. It does not have great laughs, biting wit, deep insights into the human condition, or brilliant intensity. It's not that kind of film. What the DVD does have is an extremely good commentary by Nancy Meyers. (It also has a "making the film," film which has a very interesting description of the English locations, but suffers from too many "he's great", "she's great", "he's so funny", "she's so funny" "interviews.") Meyers discusses in great detail the decisions that went into writing and directing the film, including the casting process, the choice of music, costuming, sets, and so on. As with most commentaries, it is very interesting to observe what is talked about and what is not discussed. Here, it is the details that concern her, not a discussion of the whole concept of the film -- the fact that she is making a romantic fantasy about real people (something slightly different from a romantic comedy about real people -- eg Clueless or Sleepless in Seattle -- or a romantic fantasy about fabulous people-- eg Pretty Woman). The slender reality of the basic premise holds together, I suspect, because of the richness of detail described so well in the commentary. So many of the details she mentions are so subtle they are almost subliminal, and almost impossible to notice explicitly if you have not been clue'd into them, yet they do seem to really help ground the film. A pleasant movie, probably best around a fireplace with popcorn during the winter holidays... Yes, it probably will make for seasonal repeat performances on television -- one of the perks of using "holiday" in the title. And it is not by accident that the movie ends with Kate Winslet, just barely audible as the camera pulls back from the cute country cottage where all the principal characters are having a party, saying, "Happy New Year!" It is illegal to hold a cell phone in one hand and talk while driving. The woman driving in the car next to me this afternoon found a solution for this problem. She did not talk while holding the phone in one hand and driving with the other: she used both hands to text message. For anyone interested in acting, directing or understanding Shakespeare... There is a terrific opportunity, this summer, to study at the Public Theater, one of the most important venues for continuing, modern, American productions of Shakespeare's plays. The Public (we're on a first name basis) has a program they call the Shakespeare Lab, and they are now accepting applications. The highly acclaimed Shakespeare Lab actor training program is now accepting applications until April 9 for its 13-week acting intensive on May 29 - August 25, 2007. The Application deadline has just been extended to MONDAY, APRIL 9. Scholarships are available to defray the cost of tuition. Now entering its thirteenth year, The Public Theater Shakespeare Lab presents a unique opportunity for actors to develop their classical skills. The Lab immerses the actor in Shakespeare's plays and language under the instruction of some of the most respected teachers of classical theater in New York and the world. In previous years, faculty has included Christopher Bayes, Michael Cumpsty, John Dias, Kate Forbes, Orlando Patoboy, J. Steven White, and Janet Zarish. Guest Artists have included Liev Schreiber, Oskar Eustis, Roger Rees, Jordan Thaler, Mark Lamos, Dana Ivey, and George C. Wolfe. During the 13-week Acting Conservatory, Lab Actors will enrich their understanding of Shakespeare and his plays through intensive study and performance; develop skills in clown, movement, voice and teaching; and forge significant relationships with fellow Lab members, teachers and members of The Public Theater's professional community of artists. Numerous graduates of the Shakespeare Lab have gone on to secure roles on Broadway, Off-Broadway, and in regional theaters, in addition to work in film and television. The Lab provides a unique opportunity for actors to work on their craft during The Public Theater's world-renowned Shakespeare programming at The Delacorte Theater in Central Park. For more information about the application process, click here to visit our webpage or call 212-539-8525. I have a short (about 2 min) video On The Lot of Shakespeare's Sonnet 65, together with a short intro all about me. I'd love to have you come visit and check it out! This powerful, beautiful, violent, tender, important, inspiring, depressing, awkward, elegant film of horror and hope will be shown at the New Directors / New Films festival at Lincoln Center and The Museum of Modern Art (MoMA). War/Dance tells two stories, totally different in their nature. Both center around the same children. 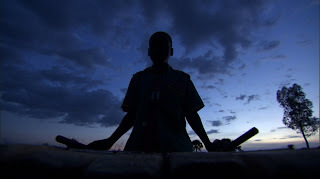 One story has the children telling their horrific stories of atrocities in the Ugandan civil wars. It is truly wrenching what people do to each other. Here is a mini-primer of living in a war zone in Uganda. 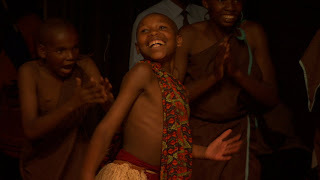 The other shows their participation in a national music competition for all the elementary schools of Uganda. This provides a fascinating look at regional instruments and folk music and dancing. The stories intersect over the difficulty the children -- from the war zone -- have in perfecting their performances and then traveling to the competition -- far to the south, in Kampala, the capital of Uganda. The music story has the structure of every other competition film. For the war story, the children face and talk directly to the camera. Events from the past are reconstructed unconvincingly, and even events from the present seem to be at least partly staged. This is not a hidden camera, slice-of-actual-life documentary. Each of the stories deserves its own audience. Each is extreme and exceptional in its own world. However, it may be difficult for music lovers to bear the tragedy of the war story. Hopefully, students of African war politics will relax to enjoy the musical experience. For those with a deep interest in both, this is a film that tries to express the redemptive power of musical culture for the victims of the havoc of war. The film is beautifully photographed, giving a stunning portrait of Uganda and Ugandans. The film makers' background is National Geographic documentary. This is the films greatest strength, greatest weakness, and the source of its greatest controversy. For they take it on faith that it is proper to tell the story of the children this way. Neutral. Just show the situation. Have the children do and show what happened. Given the violence that they have experienced, including the death of many parents, it is not necessarily clear that -- even if the children want to tell their story -- that it is good for them to do so, or that proper consent has been provided. Personally, I am always uncomfortable with films that put children -- even fictional characters -- in harm's way. (Of course, that was a major resason I could not enjoy, even if I could appreciate, Pan's Labyrinth.) I wonder what affect it may have on children: re-living real horrors -- especially since now the record is forever available, and could even be twisted to cause harm by some evil hand in a volatile area. War/Dance won the directing prize at the Sundance Film Festival, has been picked up by ThinkFilm, and will be show at New Directors/New Films. For those who appreciate both sides of this story, it is an important and powerful film. TSI (Theatre Studio Inc) is offering discounts on rental of rehearsal spaces and theaters when you sign up during March. They have an excellent 99 seat theater and a comfortable, flexible 40 seat theater, in an attractive space in a great neighborhood (123 East 24 Street at Park Ave -- in NYC). For more information check their website http://www.tsi123.org, or call 212 719-0500 ext 1. Warning! Do not try to eat and watch Borat at the same time. It may result in rapid forward ejection of the food during an explosive laugh; or worse, sucking food into the lungs during the inhaling that precedes a guffaw. I know. I watched the DVD of Borat while I tried to eat. Almost deadly, and very embarrassing. Here's some more information -- from Wikipedia -- about Borat. I've always liked alien-reactions-to-our-land humor (remember Mork). Especially when it's mixed with sharp social and political satire as I think it is here. The gross-out parts I could do without. Technically, this movie is called, Borat: Cultural Learnings of America for Make Benefit Glorious Nation of Kazakhstan." And even though Kazakhstan has reportedly protested, given what Borat learnings in America, it may well indeed benefit Kazakhstan. This is quite a season for festival films in New York. Currently at Lincoln Center is a festival of French films. Many directors are in town for the screenings. Only one actress seems to be coming: Isild Le Besco, in The Untouchable, for which she was recently named best actress at Venice. 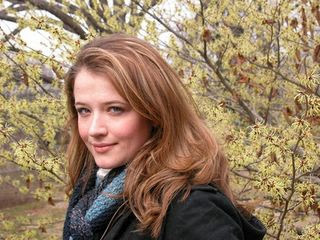 At 25, she has 32 films to her credit, and is currently directing scenes for her own film while she is in New York. From Mar. 21 to Apr. 1, with screenings at MoMA’s Titus 1 Theater and Lincoln Center’s Walter Reade Theater comes New Directors/New Films 2007 which consists of 26 feature-length films and five shorts, from 19 countries, with 9 first-time feature length directors. I remember Steven Spielberg coming with Goldie Hawn for Sugarland Express, more than 30 years ago. The Lincoln Center Film Festival, earlier this year, was exceptionally interesting. Among the films that got their New York debut were Oscar nominee and awards films, The Queen, Volver, Pan's Labyrinth, and Little Children. To my mind, Ivana Baquero, the child in Pan's Labyrinth gave the year's most audacious performance. In the film she performs in Spanish. At the press conference, she was precociously articulate in fluent English. I videotaped several press conferences from the festival for posting and VLOGed a short excerpt from a press conference with Penelope Cruz, and extensive excerpts (with only the boring parts left out, as they say) from the press conference for The Queen. Also shown was Bamako, about the role of the World Bank in causing problems in Africa. A special panel at NYFF about the role of the World Bank included Harry Belafonte, and Nobel Laureate, Joseph Stiglitz (economics), whose book "Making Globalization Work" describes methods for, well, making globalization work (both for underdeveloped countries and the US.) Warren Beatty's Reds was shown at the festival. It is a true masterpiece. Like good wine, it is better aged than it even was when it was first made. From April 25 to May 6, downtown New York becomes one big film party for the Tribeca Film Festival, perhaps the most ambitious festival of all in New York City. There's an interesting article from AOL/BUSINESS 2.0 on Jimmy Wales, creator of Wikipedia. My own experience has been that Wikipedia has some of the best written, most interesting articles on subjects from geography to films to science, of any source I know. They contain simple explanations and technical descriptions, with links to related topics and well-selected references for more information. It is hardly hyperbole to say that Wikipedia, almost by itself, delivers on the promise of the Internet, hypertext, and open source to provide high quality information to everyone, at minimal cost (in multiple languages)! On The Lot -- now widely known as OTL -- is the partnership of Steven Spielberg with Mark Burnett, the creator of so many reality shows (Survivor, The Apprentice, The Contender, The Restaurant...). The show (series premier Wednesday, May 16th on Fox) will feature 16 directors creating short film challenges in a competition to win a one million dollar development deal (and a reputation! perhaps fame! or notoriety!). Making a short film in a week is hard. Depending on what resources are made available (do they get a script -- or a writer -- or do they start from scratch? do they get assigned a cast -- or a pool of actors to work with -- or do they start from scratch with casting? do they bring in people they know -- or do they have to build a crew? do they get a line producer to handle the organizational details) ... and depending on what handicaps and restrictions are placed on the directors (is it a specified genre each week? does it have to be a certain length? does it have to be made on location in some foreign place? does it have to use green screen and special effects?) making a short film in a week could be anywhere from thrilling to excruciating pain. As part of this project, OTL has set up a website, www.thelot.com, and invited directors to submit short films. Roughly 30,000 films, numbered more or less consecutively from #1 films.thelot.com/films/1 in October, 2006 through at least #31,563 films.thelot.com/films/31563 in February, 2007. The quality of most films is very high, but not perfect; and it's always fun to see where films work and where they don't. Anyone can visit the site and see the films; registered users can also rate and review them. Comments range from very charitable to dismissive. Films that somehow wind up on the front page of the website have gotten as many as 40,000 viewings just since Feb 16. The site itself is very good in some ways, and needs some work in others. What's most interesting about the site is that through the message boards, blogs and reviewing each others' films, this site is developing a community of filmmakers. Technically, the streaming of films is working extremely well. But the information architecture is a bit primitive. The site badly needs a good search engine that will identify films and find information in the blogs and boards. Adding, editing, and deleting posts, comments, and reviews is a little chancy, with things not always working as one might expect. The front page features a small set of films getting huge traffic to the near exclusion of others -- cycling pictures on the home page would benefit more films. A section of official news, or a blog by the producers would be welcomed by the whole community. (For example, the press release above-- assuming it's legitimate -- should be on the site itself, not "hidden" elsewhere.) Thumbnails for the films are taken kind of automatically -- and randomly -- from a frame of the film, and can not be changed ; it would be nice to pick the thumbnails so they promote and represent the film accurately. (Whoops -- late breaking news just announced -- some variation in the thumbnail is now possible!) The only way to check the number of viewers and the ratings for a film is to go look at it -- it's nice to have statistical information available on the filmmaker's profile, not just on the film page. All these and other related changes on the site could make OTL the most important site for user-generated serious content: YouTube is dominated by silly video clips and uploads of commercial material. OTL is all good work by new filmmakers. Currently, the site is commercially innocent. As a business proposition, it has the potential to become the hub for a community of very active social networkers, who are voracious consumers of very expensive technology. There are some spectacular new images (click on a picture for the high resolution image), and a time lapse movie, taken of Saturn by the Cassini spacecraft. All images and captions are from NASA. The giant planet is a moody world whose disposition appears to change with the view. Its atmosphere rages with thunderous and hurricane-like storms. Its majestic rings spin a tale of ancient collisions and cataclysm. And its moons may hold secrets to the origins of life. This view looks toward the lit side of the rings from about 28 degrees below the ring plane. 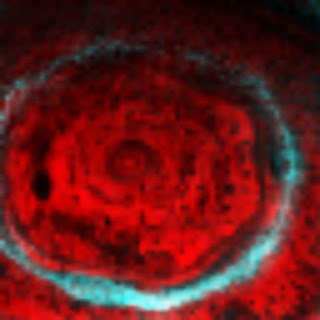 The image was taken using a spectral filter sensitive to wavelengths of infrared light centered at 890 nanometers. The view was acquired with the Cassini spacecraft wide-angle camera on Jan. 30, 2007, at a distance of approximately 1.1 million kilometers (700,000 miles) from Saturn. Image scale is 60 kilometers (38 miles) per pixel. Saturn's shadow stretches completely across the rings in this view, below, taken on Jan. 19, 2007. Surely one of the most gorgeous sights the solar system has to offer, Saturn sits enveloped by the full splendor of its stately rings. Taking in the rings in their entirety was the focus of this particular imaging sequence. 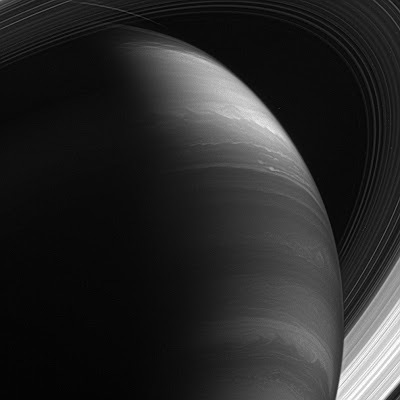 Therefore, the camera exposure times were just right to capture the dark-side of its rings, but longer than that required to properly expose the globe of sunlit Saturn. Consequently, the sunlit half of the planet is overexposed. Between the blinding light of day and the dark of night, there is a strip of twilight on the globe where colorful details in the atmosphere can be seen. Bright clouds dot the bluish-grey northern polar region here. In the south, the planet's night side glows golden in reflected light from the rings' sunlit face. The view is a mosaic of 36 images -- that is, 12 separate sets of red, green and blue images -- taken over the course of about 2.5 hours, as Cassini scanned across the entire main ring system. This view looks toward the unlit side of the rings from about 40 degrees above the ring plane. The images in this natural-color view were obtained with the Cassini spacecraft wide-angle camera at a distance of approximately 1.23 million kilometers (764,000 miles) from Saturn. Image scale is 70 kilometers (44 miles) per pixel. Pictures from the Cassini spacecraft were assembled into this time-lapse movie, which shows what it looks like to pass through the rings of Saturn. Several moons of Saturn are shown orbiting the planet. The pictures were taken over a time span of 12 hours. "This life-like movie sequence captures Saturn's rings during a ring plane crossing--which Cassini makes twice per orbit--from the spacecraft's point of view. The movie begins with a view of the sunlit side of the rings. 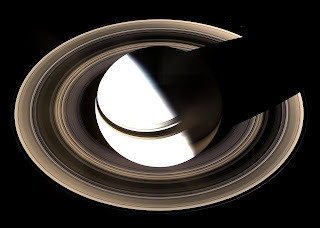 As the spacecraft speeds from south to north, the rings appear to tilt downward and collapse to a thin plane, and then open again to reveal the un-illuminated side of the ring plane, where sunlight filters through only dimly. The striking contrast between the sunlit and unlit sides of the ring plane can now be fully appreciated, thanks to the sense of continuity in time and space provided by this brief clip. The movie consists of 34 images taken over the course of 12 hours as Cassini pierced the ring plane. Additional frames were inserted between the original images in order to smooth the motion in the sequence -- a scheme called interpolation. Six moons careen through the field of view during the sequence. The first large one is Enceladus, whose slanted motion from the upper left to center right nicely illustrates the inclination of its orbit with respect to the rings. The second large one, seen in the second half of the movie, is Mimas, going from right to left. This movie begins with a view looking toward the lit side of the rings from about 9 degrees below the ring plane. It ends when the spacecraft is 8 degrees above the ring plane. The clear-filter images in this movie sequence were taken with the Cassini spacecraft wide-angle camera on Jan. 17, 2007, at a distance of approximately 900,000 kilometers (500,000 miles) from Saturn. Image scale is 48 kilometers (30 miles) per pixel.